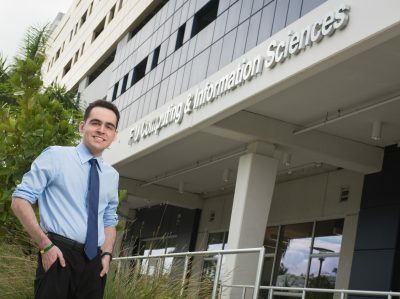 Ricardo Mizos has autism and didn’t speak until he was four years old, but with support from his parents and early therapeutic intervention, he recently graduated with a degree in information technology and plans to return to FIU in the fall for graduate school. Mizos, 23, dreams of starting an online business, but his mother, Maria del Carmen, will tell you childhood was tough. The family came to Miami from Cuba when Mizos was a preschooler to get him the resources he needed, including ABA therapy, one of the best known therapeutic interventions for addressing autism’s challenges. In those early years, his mother became a stay-at-home mom. She would care for other children during the day so her son could interact with those his own age and develop social skills, another area people with autism struggle with. One of the challenges of autism is paying attention, focusing and completing tasks. Yet Mizos forged on, learning to manage his time and study. He thrived at SCIS and credits his professors and staff from the Advising Center with helping him succeed. “We provide a support system for students, for their well-being, not only to get the grades, but to make them feel comfortable and at home,” said Tiana Solis, assistant director of academic advising and a lecturer at SCIS. Mizos is in good company. Adults with autism can thrive in high-tech jobs, from software programming and digital design to 3-D modeling. The reason is that when they especially enjoy an activity, many have the ability to overcome concentration problems and instead hyper-focus on a task with precise accuracy. Fortune 500 companies have taken notice, and many have launched workforce initiatives to recruit candidates with autism. At SCIS, students are doing their part to contribute to the diversified workforce of tomorrow by researching the use of robots to aid autistic students in the classroom. This summer, the Discovery Lab is hosting students from Brazil who have teamed up with graduate students to build the next generation of robots to interact with autistic students. “It’s an opportunity for us to demonstrate our robotic capabilities in developing educational programs for children, and using robots to assist in the treatment of autism, said Col. Jerry Miller, the Discovery Lab’s research coordinator. It is one of several projects underway at the lab as part of its summer series, International Revolution in Robotics. Students are working under the direction of assistant professor Leonardo Bobadilla and Ph.D. student Gregory Murad Reis. Mizos also took advantage of resources available at FIU such as the Disability Resource Center (DRC), which supports students with disabilities throughout their college experience. They also offer a social skills training group known as Blue Panthers, which meets once a week. DRC currently has nearly 2,000 active students registered; of that number, 80 have autism. Registration is not mandatory; students opt-in if they think they need the services.